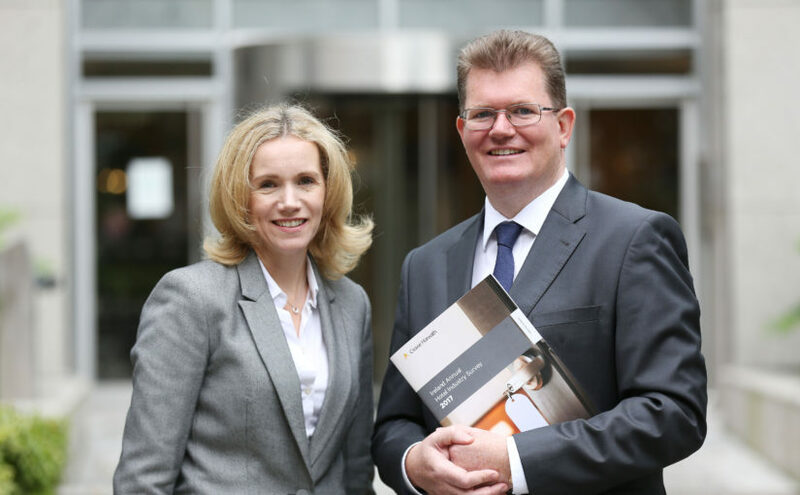 Pictured; At the launch of the 2017 Hotel Industry Survey, Mairea Doyle-Balfe, Director and Aiden Murphy, Partner, Crowe. Hotel room rates break boom era records in Dublin. Room rates at Dublin hotels have reached an all-time high, eclipsing the prices of the last boom, as prices in the capital surged at nearly twice the rate of the rest of Ireland over the past year, a major piece of industry research has found. 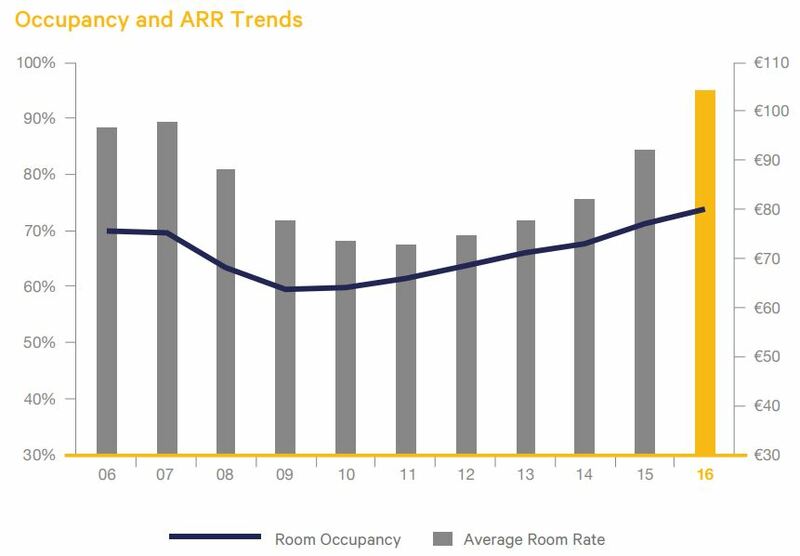 The annual Crowe hotel industry survey shows that average room rates in Dublin rose almost 15 per cent in 2016, as a capacity crunch and a huge influx of visitors from the US swelled the performance of many city properties. The average rate in Dublin is now €128, up from almost €112 last year and well ahead of the previous record of €121, set in 2006. Nationally, including Dublin, the average rate is €104. In the midlands, it is €91.40, up 8.6 per cent, while prices rose 10 per cent to €93.25 in the southwest, which is also a favoured destination of US tourists. Sky-high occupancy rates are an indicator that the hotel sector is at full stretch, especially in the capital. Occupancy of more than 82 per cent in Dublin means that the city’s hotels are full about 300 nights of the year. Average occupancy elsewhere in the State runs at up to 69 per cent, with the midlands recording the largest annual increase. Aidan Murphy, a partner with Crowe, warned that competitiveness in the Dublin sector is being eroded. He also cast doubt on a prediction by Fáilte Ireland that the capital would welcome another 5,000 hotel rooms on stream by 2020 to plug the supply gap. “I think it will take up to 24 months longer than that to deliver what is needed,” he said. The escalating rates of Dublin hotels, many of which were bought for knockdown prices by foreign investors, will bring renewed focus on to whether the sector really needs continued stimulation via a 9 per cent VAT rate. The last government introduced the special rate as a “temporary” measure in 2011 to stimulate a then-moribund industry. Despite an impressive recovery since, the industry has lobbied furiously for the rate’s retention, on the basis that a return to 13.5 per cent would harm competitiveness. This argument is undermined, however, as hotels hike prices at a rate far higher than the VAT subsidy. Mr Murphy argues, however, that any change to the VAT rate would be likely to make the sector less attractive to investors, and would hamper efforts to boost capacity to take advantage of booming demand. The Government is thought unlikely to change the VAT rate in the upcoming budget. Mr Murphy claimed hotels needed to become even more profitable to stimulate further building. Larger hotels generated almost €16,400 profit per room in 2016, compared with €13,600 per room the previous year. “At the current profit levels, it is a 15-year payback [for investors],” he said. He said Irish banks only lend about eight times profits for new hotel projects, leaving a large funding gap for developers. As well as Dublin, he said more new hotel development was needed to meet supply in Cork and Galway, while extensions to existing hotels should be enough to meet demand in other regional locations. To order your copy of the 2017 Hotel Industry Survey please contact Sinead O’Rourke. This article appeared in the Irish Times 30th August 2017.